Cinematography presented us a lot of educational movies about the game of blackjack which helped to understand the game better. One of such blackjack guides is Blackjack, Slots and Craps Winning Strategies: this is the video tutorial where you can find everything concerning 3 popular casino games. All winning methods described here were tested by Frank Scoblete, the bestselling author of many gambling books including Armada Strategies for Spanish 21. Moreover, all strategies were also tested on computers. We will not describe here everything you could learn from this DVD concerning craps and slots because we are interested in blackjack casino game here. So, what will you discover after watching Blackjack, Slots and Craps Winning Strategies? 1. The right moments when to Hit, Stand or Surrender. 2. The description and demonstration of the best strategies for single deck game and multiple deck blackjack game. 3. The demonstration of the most common mistakes gamblers make when play blackjack. 4. The explanation of a well-known Hi-Lo technique. 5. The methods for maximizing your blackjack odds. 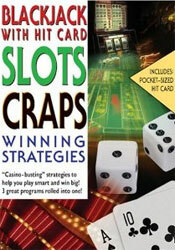 Blackjack, Slots and Craps Winning Strategies DVD was released in 2005, and critics had found it good for blackjack and craps explanations but not very useful for slots. Now this DVD is available and easy to find everywhere on the Internet. You will receive 150 minutes of a high-class blackjack tutorial which reveals all secrets of the game. This tutorial reminds Winning Strategies: Blackjack somehow; so, if you want to know everything concerning blackjack, do not forget to read this one too.